"Mea culpa, mea culpa, mea maxima culpa." Well, it's book confession time. I may have just said it's my fault, but I wrote a strong letter to author Anne Cleeland telling her it's her fault I haven't yet finished her third book, Murder in Hindsight. I was reading her Acton and Doyle Scotland Yard mysteries over the holidays, and partway through this latest one, I went back and reread Murder in Thrall, the first book. I have never read a book twice in the same week. It's her fault for writing about two characters who are that intriguing. Acton suffers from obsession, and now I'm stuck obsessing over those books. In fact, I asked Cleeland when book four is coming out. So, as long as I'm on a roll, I might as well make a second confession. 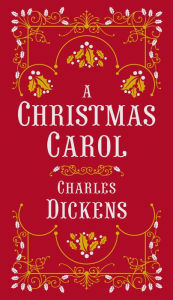 I read Charles Dickens' A Christmas Carol last night because I'm planning to go to a book discussion at one of our library's today. I was publicizing the program yesterday as one of those books we all think we know, but we haven't read. I've seen countless versions of it on TV, and it's one of my favorite Christmas shows, no matter who plays Scrooge (although I do love Michael Caine in The Muppet Christmas Carol). But, I'm one of those people who hadn't read it. OK. There are my two book confessions. I'm absolutely hooked on a new series, rereading the first book so that I haven't had time to finish the third. And, until last night, I hadn't read A Christmas Carol. How about you? Any book confessions at the end of the year? No confession but due to your review of Murder in Thrall I took it out of my large TBR group where it probably would have been for awhile and chose it for my current book. I am enjoying it very much. Thanks for the review as I now have a new series that I really like. No confessions, except that I've had a hard time getting involved with any mystery lately so most of the last 10 books I've read (fiction, that is; I have read several non-fiction books) have been short story collections. I am reading P. G. Sturges's second Shortcut Man book now. Sturges is the son of the late legendary director Preston Sturges. Oh, good, Lynn. I'm glad you're enjoying the book. You're welcome! Me, too. I'm hooked. Jeff, I'm glad you said P.G. Sturges was the son of Preston Sturges. It would have bothered me because I recognized the name Sturges. Short stories sometimes do it for me, too, when I can't get into anything, although usually I turn to essays. I have a couple collections that mean a great deal to me, and I can pick them up when nothing else works. Someday, Debbie, now that you have a copy. I read it in about an hour and a half last night. Ha! I thought maybe you were going to confess to deciding to watch TV or something instead of reading. I'm still planning on reading the Cleeland books. You've definitely got me intrigued and I went and picked them up for my Kindle. So, you did your job. You hand sold them to a reader. Or rather blog sold them. That counts, Clea, totally counts. I loved the confession that now you're reading a new book. Thanks, Clea! Well, I do have NCIS on a lot, Kay, but I'm not giving up reading for TV. Good! That makes two of you who are going to try the Cleeland books. I have Cleeland on my "to read" list thanks to you. I didn't "read" A Christmas Carol until I was in my 40's and haven't read it since BUT I have the Audible edition of Tim Curry reading it and listened to it on Christmas morning this year. I'm told it isn't the entire story but the performance is outstanding and I will probably re-listen next year. The version read is the one that Charles Dickens abbreviated for his readings around the world, including those he did in the United States. That I found very cool.